Warning - it's a long article but do read it through the end. Does your profile picture reflect you’re a serious artist (some art/canvases in the background) or does it just have a ‘cool’ selfie on it? Is your profile photo just a blurry close up? See our tips for taking the perfect artist profile photo here. How's your cover photo looking? Does your bio tell them what you're about? Read our blog on how to write a great artist bio. Keep it simple, clean and crisp - all of it. Here's an example of inspiration from Katie Wyatt - one of our best performing artists. How well presented is your artwork listing? Are the photos high-res enough? Can collectors zoom in and see the texture of the artwork/paint/canvas and all relevant and significant details? Check out our resident photographer's tips on how to take a high quality artwork photo. Using in situs - Good! Are they reflecting the size of the artwork realistically? If you have a real insitu inside your studio - collectors love this. Learn how to create in situ images. How are the sides painted? What's the hanging arrangement? Show everything that they might have a question about. Selling framed works? Check out our guide for selling framed artworks. Artwork descriptions - What's the story? People like engaging with an artwork, its story and emotion. For a lot of our collectors, artworks are conversation starters and they love talking about something they've just acquired. Give them something to talk about. See our best practice guide for creating appealing artwork listings. Info Accuracy - Is the width and height in the correct columns? Are you measurements in CMs or MMs? Are the photos reflecting colours accurately? You get the drift. Inaccurate info leads to lack of trust or returns. Imagin getting something worth of thousands of $$ and it not being as promised online. Collectors look at all the works in your portfolio before buying one. Are there old works that you’re not too fond of anymore? Remove them from your portfolio / mark as drafts. Keep your portfolio your best portfolio. Less can be more! Make sure your works are consistent. If your works are from an old series and your style has progressed think twice before adding them. See 7 mistakes to avoid when selling your art online. Check out our 6 tips to boost your artist profile. It's important in life but even more so in a professional environment. At Bluethumb, our average response rate to collector queries is under 3 minutes (this is including after hours communication). This does mean less sleep but great service. Are you easily accessible over emails/texts/calls? Put your most contactable numbers in your accounts so the team can reach you quick and easy. Do you have a landline number in your profile - fun fact, it can't receive texts when you sell something (or when we try to reach you). It’s team Bluethumb’s full time job to keep on top of all questions that are coming through about your artworks. Mention this in your listing (e.g. ask Bluethumb about commission/more photos etc.) so we can easily answer the small itsy bitsy questions (e.g. is this ready to hang - the most common question we get). Alright! We're getting in to some serious stuff now. Are your prices uniform across all platforms that you sell through - including your website? They should be! Even if your website doesn't include shipping prices or agent's commission. Price uniformity is an industry standard and can sometimes be missed very easily. This instills a confidence in the collectors towards costs and avoids any price related discrepancies cross platform. This is also something we stand by quite strongly and is also a part of Ts & Cs of all art market platforms (including us - read details here). How does this affect you might ask? Most people only make decisions based on pricing when they're on the checkout/order page. That means, any discrepancies in pricing pushes them towards losing confidence in the brand (that's you as an artist). This pushes them back to the cycle of finding something they want and doing this all over again - pretty discouraging. How's your relationship with your agent? That could be your local gallery or your online agents like Bluethumb. Our best selling artists state this as the single most important factor in building recurring sales and long term, trusting, relationships. Online agents spend significant amount of effort and funds in marketing online (as we do - in fact more than 50% of what we earn). This means a lot of effort and funds are going in to find new collectors and bring them to the site. If these collectors then contact you directly for a bargain - are you referring them back to the platform they found you on? (b) tells them that they can trust you to pass leads on directly for commissions and personal chats with the collectors. Not doing this tells your agent that they can't trust you - that means you do get this one sale but no more leads through them again. It's also a case of being fair and just - if someone's earned you a lead, reward them with trust so it builds into a long term relationship. Here's a small video from our Co-Director and Co-Founder Edward Hartley talking about our marketing strategy and the challenges that we face. Collectors always want to know more about you so they will find your website and social media before acquiring your work. What does your website say about you? Does it have your history, bio, photos? This helps. If your website doesn't have a purchase function - are you sending your visitors to somewhere where they can buy your work online? This could be as simple as putting a link to that artwork on the platform you sell from. If you don't know how to do this - we can help. Here's our detailed article on best practices to increase sales - Tips to increase sales on Bluethumb. Just sold something - share on socials, add it to your website's 'Sold' section. Learn how you can use Facebook to market your art. Won awards - spread the news. Got published - let them know (all of them). Fun fact - the Just Sold page on Bluethumb is the highest driver of sales. An artist is way more likely to get a sale if they're already on the Just Sold page. It's hardly surprising - this means they know you sell (trust and confidence) plus also know what others are collecting (trending). Do everything you can to get on there. 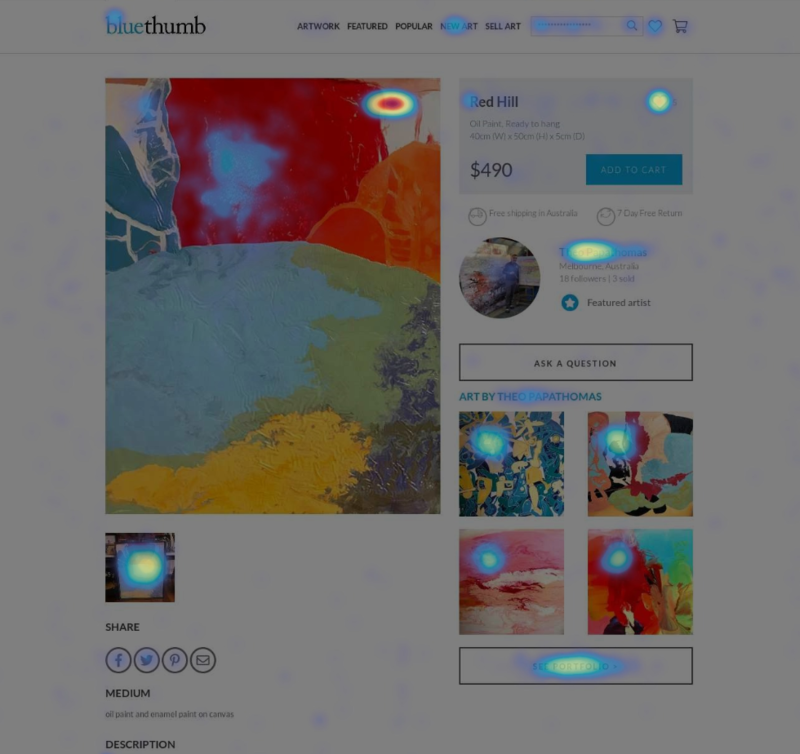 This is a heatmap of where people click on an artwork listing. See those clicks on the artist name, portfolio, more artworks and the additional photo - that's over 95% of all visits. Want to know how to get noticed by our curators? Read this handy guide for what you can do to get more attention. Have more questions? Ask us here or participate in our fortnightly webinars. We're here to help!